There’s plenty of biology in the beer you’ll be swigging during the Super Bowl game on Feb. 5. 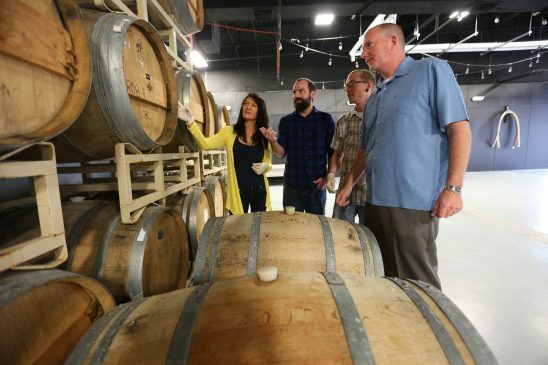 With the popularity of craft beers, local brewers are turning to a UCF College of Medicine researcher and his microbiology students to help perfect the taste and color of America’s favorite fermented beverage. Sean Moore, associate professor of microbiology, has created the Applied Industry Microbiology research program that brings together student scientists, researchers and industries that use microbes in their products. Drinking spoiled beer, although not deadly, will leave a bad taste in your mouth and thousands of dollars in lost sales for the brewers. Red Cypress Brewing in Winter Springs, Fla. is one of the breweries that is working with UCF and Dr. Moore’s lab to develop systems to test and maintain fermentation standards so the company’s craft beer has a consistent taste and quality. They are able to identify the microbes that are impacting the beer’s taste and where they may have come from. During brewing, grain is mashed and soaked in water which converts the starches to sugar. That liquid is boiled, hops are added and the liquid is cooled. Yeast is added, which converts the sugar in the liquid to alcohol. If the yeast doesn’t ferment properly or if other bacteria enter the liquid, the beer’s taste can be adversely affected. Fermentation is also used in other food processes like pickling vegetables and producing yogurt. During the two-week beer fermentation process, Moore’s students visit the breweries and test samples, looking at whether fermentation is progressing and checking for bacteria that shouldn’t be present. A dirty line or contaminated vessel can destroy hundreds of gallons of beer, a loss small breweries can’t afford. Large breweries have on-site labs but Dr. Moore says molecular testing is essential for smaller craft breweries to safeguard consumers and investors. But the industry partnership happened because Moore had another goal – help students leverage their science backgrounds to find work in industry. He said many of his UCF undergraduates don’t want to attend medical school or do basic science research. They want a way to use their science knowledge in a business setting and the craft beer market is giving them that opportunity.